Each day of our existence we are reminded of the grim reality of death. It haunts us. We know so little about it. In fact, we know almost nothing regarding this ultimate physical experience, except for what is revealed in the Bible. But the biblical information is limited, and so false notions about death permeate society’s thinking. The following discussion represents a brief survey of some of these erroneous concepts. Mary Baker Eddy, founder of “Christian Science,” alleged that “there is no death” (n.d., 575). She contended that death is but an “illusion.” How can a rational person subscribe to such a notion? We mention this more as a matter of oddity than anything else. Mrs. Eddy’s tombstone is an eloquent argument against this absurd doctrine. But the fact is, God warned grandfather Adam that death would be the result of disobedience (Genesis 2:17), and Paul reaffirmed this divine truth: “[T]hrough one man sin entered into the world, and death through sin; and so death passed unto all men, for that all sinned” (Romans 5:12). In a manner of speaking, Adam stood as the representative of the human race. When the first man violated Heaven’s law, humanity was cursed with the penalty of having to suffer the consequence of that initial transgression—though not the personal guilt. The truth is, the entire creation has been blighted as a result of sin (cf. Romans 8:20-22). 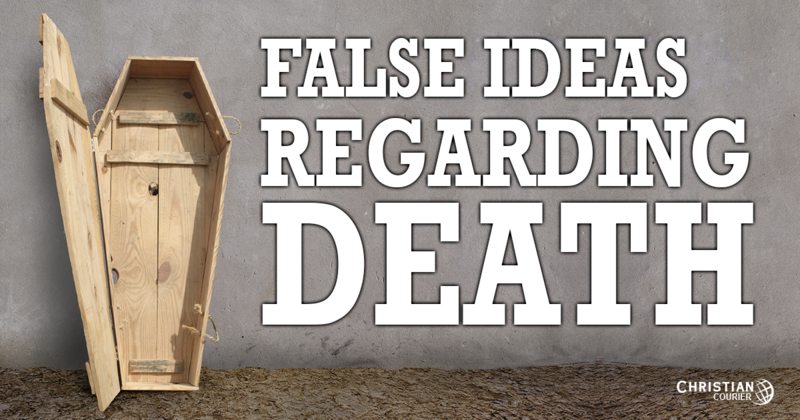 Skeptics ridicule the biblical narrative regarding the commencement of death. It is viewed as an absurd myth that belongs in the Stone Age (Allen 1990, 108). But no infidel can explain why death occurs. If life had the ability to “jump-start” itself, as evolution’s theory of spontaneous generation asserts, why can’t it sustain itself within the individual? And is it not remarkable that evolution—supposedly a progressive, refining process—has not been able to eliminate death? If “natural selection” is working toward a higher evolutionary pinnacle, why doesn’t science observe an increase in human vitality? Actually, just the reverse is true. The history of biological life is a record of degeneration, not regeneration (see Jackson 1994, 2-3). Why haven’t we evolved immortality? Death is an argument that no materialist can answer! Why hasn’t modern medicine been able to make significant advancement in human longevity over the past three thousand years? In David’s day, men lived to three-score and ten years—perhaps with strength to four-score—on average (cf. Psalm 90:10). We have not improved these statistics with our twentieth-century medical technology. Some people are paying thousands of dollars to have their bodies frozen, in the hope that science will discover a cure for the cause of their demise. They aspire to be ultimately thawed in order to resume an eternal earthly existence. What futility! Mortality points strikingly to God. In India, four hundred million Hindus believe in reincarnation. This is the idea that the human soul passes through a series of earthly phases, i.e., bodies human or animaal—depending upon the particular ideology—before finally attaining release from this chain of events. In recent years, New Age zealots in this country (e.g., Shirley MacLaine) have popularized the idea of the transmigration of the soul. Recent polls suggest that more than half of the American public believes in the possibility of these experiences. However, with the exception of a few miraculous cases back in history (e.g., the resurrection of Lazarus), “it is appointed unto men once to die” (Hebrews 9:27). Each human being will give an account to the Lord for the deeds done in his “body”—not bodies (2 Corinthians 5:10). Bible teaching contradicts the idea of reincarnation. Suicide has reached epidemic proportions in America. Self-murder is becoming an increasingly popular way to “end it all.” But the fact is, death ends only one’s earthly existence, not his personal existence. Biblical evidence makes it abundantly clear that at the point of death, the spirit of a person merely leaves the body (James 2:26). Separation, however, is not the same as extinction. Scriptural information indicates that in death the soul of man enters the Hadean realm (cf. Revelation 1:18; 20:13, 14). The narrative regarding the rich man and Lazarus forcefully reveals that death does not terminate human existence (Luke 16:19-31). Too, Christ promised the penitent thief that the two of them would be together again in Paradise that very day, following their respective deaths (Luke 23:43). Every biblical passage which speaks of the coming judgment argues for the continuity of human existence. While the Bible speaks of death as a “sleep,” that term is used only of the disposition of the body. Scripture knows nothing of “soul-sleeping.” The part of man which “sleeps” in death is that which is deposited in the dust of the ground (Daniel 12:2). This involves only the body, not the soul. Again, both the rich man and Lazarus were conscious following their deaths (Luke 16:19-31). Moreover, those souls who had been martyred for the cause of Christ, as depicted in Revelation 6:9-11, were obviously conscious as they cried out for divine justice on their behalf. (For further study, see Are the Dead Conscious?). Our Mormon friends subscribe to the doctrine of “celestial” marriage. This is the notion that marriage is not for time only, it is for eternity as well—for those who reach the highest degree of exaltation (Smith 1952, section 132). But this dogma is woefully at variance with the testimony of Jesus. Certain Sadducees posed a problem for the Lord: A woman had been married successively to seven brothers during her lifetime. Whose wife would she thus be in the resurrection? Christ responded: “You do err, not knowing the scriptures, nor the power of God. For in the resurrection they neither marry, nor are given in marriage, but are as angels in heaven” (Matthew 22:29, 30). The marriage relationship does not obtain in heaven. Some allege that there will not be any remembrance of earthly relationships in heaven. Supposedly, heaven’s citizens could not be happy with the awareness that unredeemed loved ones are not there. However, the Bible presents solid evidence that there will be recognition in the celestial region. The Old Testament patriarchs fully expected to be reunited with their redeemed loved ones (Genesis 25:8; 37:35; 2 Samuel 12:23). The Lord promised that we will fellowship with Abraham, Isaac, and Jacob in the kingdom of heaven (Matthew 8:11). Will one know when that promise is realized? If so, then the patriarchs will be recognized. And if we will know them, it is certain they will know each other! I have discussed this topic at greater length elsewhere (Jackson 1987, 1-3). A number of religious groups advocate concepts which suggest the possibility of preparation for eternity after death. Roman Catholicism, for example, has the doctrine of purgatory—the place where souls are supposedly purged of sin before they enter heaven. Mormonism advocates the notion of “baptism for the dead.” Charles T. Russell, founder of the “Jehovah’s Witnesses,” argued that salvation is not “confined to the present life” (1912, 9ff). But there is no truth in these vain hopes. After death, there is only the prospect of judgment—not a further opportunity for obedience (Hebrews 9:27). In the parable of the virgins, Jesus taught that in whatever condition one goes to “sleep,” i.e., dies, in exactly that same state he will meet the bridegroom (Matthew 25:1-13). Moreover, there is a permanent, impassible chasm between the place of punishment and that of reward, and no man can cross it (Luke 16:26). There is no post-mortem plan of salvation. Now is the day of redemption (2 Corinthians 6:2). According to recent surveys, more than half of all Americans believe they have been in contact with someone who has died. But the Bible teaches that the dead have no knowledge at all as to what is transpiring upon this earth (Ecclesiastes 9:5, 6; cf. Isaiah 63:16). If the rich man of Luke 16 could have communicated with his brothers on earth, he surely would have done so (Luke 16:27-31), but he was powerless to reach them. The fact of the matter is, the Scriptures condemn even an attempt to contact the dead (cf. Deuteronomy 18:10-12; Leviticus 19:31; 20:6, 27). The ancient Sadducees denied the ultimate resurrection of the human body (Matthew 22:23). Their modern counterparts, the advocates of “realized eschatology,” are similarly deceived. Max King alleges that the resurrection discussed in 1 Corinthians 15 is merely a “resurrection” of the Christian cause from a period of intense Jewish persecution, and that such resurrection was fulfilled in A.D. 70 with the fall of Judaism (1987, 429ff). A more perverted concept cannot be imagined. The Bible affirms that our resurrection from the dead on the “last day” (cf. John 11:24) will be analogous to the Lord’s bodily resurrection (see 1 Corinthians 15:20; cf. Philippians 3:20). Actually, Paul puts the denial of a future bodily resurrection in the same category as a repudiation of the resurrection of Christ himself (1 Corinthians 15:13-16). What are the consequences of proclaiming such a heresy?